we had stayed in the property for 4 nights !!! the property is well maintained and clean! it was my wedding. the staff is very friendly i.e. jai singhji the manager vikas ji the team coodinator and chef nandlal makes lip smacking food !!! they also give a property tour which is very informative. i had stayed in room no. 101. which is in the centre of the property from which u have the look of full palace !!!! a must visit place !!! exp for life time !!! 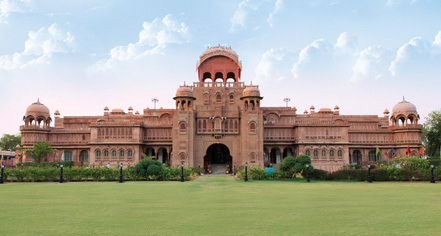 The most well maintained and managed heritage hotel in Bikaner. We came in here for lunch for three consequential days as the food was mind blowing. Ch?f Nandlal spoke to us and after understanding what sort of food and spice level we prefer, he simply created marvels that came out of his kitchen. From items such as Lal Maas to Mutton Khas Kebabs to Kair Sangri everything was a joy to taste and to eat. The extensive grounds and reception areas as well as pool and other facilities were spotless and well managed. The flapping of pigeons wings and wind rustling in the trees and plants were the only noise one could here for a long time. Every time I think of Bikaner, I think about the lunches I had here which went into hours. 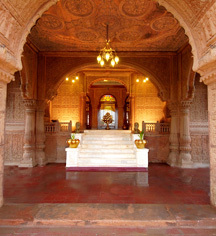 the property has been very well maintained and one can spend hours just watching the architecture of the palace. It has very well maintained gardens and one could probably walk for a couple of hours without getting disturbed or repeating the place. Depending on the season flora and fauna is visible. In December i saw peacocks and many different birds. The sit down dinner in traditional Rajasthani cuisine is simply awesome. I am a vegetarian but was told that their Lal Maas (red meat) dish is a delicacy. You feel yourself as a king when you stay in this hotel. Wonderful suite I got to stay with ultimate luxury. Everything was nice and candle light dinner was awesome. Morning breakfast is ultimate. staff behaves as they treat you like king.